Automation promised to bring us shorter work days and more time to do what we love. Now, that’s finally starting to look like a reality. We talk to pioneering digital firm, Farnell Clarke, about how they’re transforming their people and culture. Farnell Clarke is renowned for doing things a little differently. Earlier this month, they announced they were dropping the 37.5 hour week and throwing out the traditional fixed annual holiday entitlement. From February onwards, they will offer unlimited holiday and six-hour days to fit around their team’s personal life. Plus, they can work when and where they want. We talked to the firm’s founder, Will Farnell, to find out more. A couple of years ago, we began to read more about the successes others were having with more flexible working cultures. We then did an internal survey with our staff, asking them a bunch of questions such as “Do you think you could do all your work in a 6-hour day?” Unsurprisingly, they loved the idea. In fact, 90% thought they could do the same amount of work. Why six hours? Most research suggests that we operate at our peak for six hours. After that, productivity levels start to drop. These six hours are also coupled with flexibility. You could work three hours in the morning, go to the gym, have lunch, then work another three hours in the afternoon. This style of work helps our team achieve a great work life balance and means even though they may be working more intensely in those six hours, they will have more recovery time. Want to learn more about how to go digital? Join Will Farnell and Receipt Bank at 11 am GMT 13 February for the 10 Elements of the Digital Firm webinar. Like many firms over the past decade, we struggled to recruit new talent. 18 months ago, we completely refitted our office and built a culture we are proud of. This move to a more flexible way of working seemed a natural extension of this culture. We ensure that we recognise our team’s demands and challenges, and make sure this is a great place to come to work. We want our team to love coming in and buy into our values, as well as firm personality. 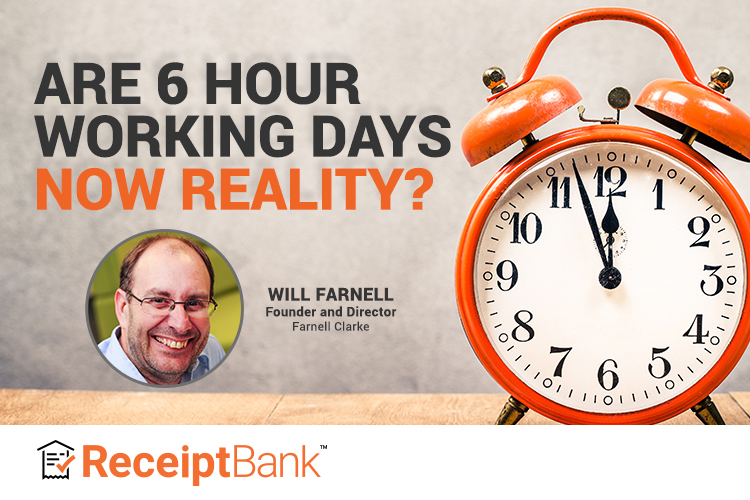 I first founded Farnell Clarke from the belief that clients of accounting firms deserved more. My vision was to change the way people perceive accounting and change the way it was delivered. When we first started, we grew very quickly, and I expected that growth to slow down over time. It kind of didn’t, so we made a lot of mistakes along the way in not preparing for that sustained growth. We planned to a point, based on a wider mission to make accounting simple and easy. We have always strived to do things differently. That’s our driver, and that’s enabled our growth. There are five things we want to be known for. On top of this, we have lighthearted drivers for the team, ranging from messages like you can be serious without a suit, and the things we work hardest for are the things that reward us the most. Plus, good just isn’t good enough. Two years ago, we brought in James, our new Managing Director. I had previously neglected some internal work, and James came in to fix that. Off the back of it, we realised we needed to bring in the right people in the right roles. This was our first focus-point. People and culture work in tandem; people are central to your culture, and you may need to make some difficult decisions. A few years ago, we tried to make our way of working more flexible yet struggled to make it work with some team members. That was a fundamental flaw, and a catastrophic failure from our point of view. We should have reviewed the situation with those individuals rather than change the whole approach around them. Now, we trust our team to work well and how they want. If they choose to work more than 6 hours, that’s fine! So as long as they’re getting the work done and the client is happy, that’s the key. And that’s the thing with a flexible working culture. It requires a change in mindset. We give our team flexibility in exchange for exceptional performance. You must exceed expectations, and in return you have autonomy, freedom and the ability to focus on higher value needs. As a business, our focus has always been on what we deliver to clients. Our key challenge was measuring output. When we first decided to make this move to more flexible working arrangements, we still had a lot of work to do as a business. We needed to speed up turn-around times and get to the point where we were doing things at the level we wanted. To manage our team’s work patterns and ensure our clients’ needs remained front and centre, we implemented a range of tools. We now use Slack for communication and Asana for task management. This helps us focus on output, plus gives us a whole bunch of benchmarks and metrics to measure against once we flip into the new way of working. This has taken two years of preparation to do confidently. We set targets for turnaround time of year-ends for limited companies. Like most companies, we were filing 75% of accounts between months 7-9. Our focus lay on hitting deadline dates, rather than internal targets. Now, we are looking to turn around those limited company year-ends within 4 months. We hit this in September 2018 and announced flexible working in October 2018. This was our first KPI. For VAT returns we now aim for the 30th of the month rather than the external deadline of the 7th of the following month. How long does our team take? We use software to track things like email response times, but it’s not about monitoring every email but just ensuring that the team are communicating with our clients quickly and efficiently. This is all about output. Whereas before, we were measuring input - how many hours our team were putting in each week - these hours are now irrelevant. Now, it’s all about delivering that exceptional service to our clients. As long as they are doing that, it shouldn’t matter. As long as they’re delivering above and beyond, that’s fine with us. If you are considering switching gears to focus on your output, the first place to start is dropping time-based billing. This model will always focus on input. As technology drives efficiency, it makes it even more important to focus on output. Otherwise, your fees and margins are at risk of falling. So, rethink the value you give to clients. Ultimately, clients should be paying for outputs not inputs. It’s a huge mindset shift, that’s intrinsically linked to trusting your team. If you don’t trust your staff, should you be working with them? It’s a shift towards treating your team like adults, engaging them and asking them to focus on what you as a firm want to deliver. We couldn’t do what we’re doing without technology. Technology is an enabler. I spend a lot of time talking to firms about what digital transformations means. We instantly think about technology, it’s simply that: an enabler. You still need to think about your people, process, culture and why you’re using it. Any tech that doesn’t improve your client experience is not worth spending your time on. You need to make sure you’re using technology in the right way. We certainly could not do it without tech that enables us to work from anywhere. January is usually our busiest month. We are rolling out this new way of working on the first of February - we certainly didn’t want to do something so fundamentally different in the middle of tax season! Thanks to our preparations, we have a great vibe in the office. Everyone is excited, we had a much less stressful December and because we are much further ahead, coming into January feeling more positive. I think everyone is looking forward to what’s in store for February. We’re entering a new way of life for Farnell Clarke. We don’t know everything about how it’s going to work. But what do we know? We know that we’re going to work really hard at this, because we believe this is what we should be doing for our team. And a happier team means happier clients, and a greater ability to deliver a great experience. In terms of pushback, we mainly received questions and a need for reassurance. For our team, managers were keen to understand more about how to manage their team remotely. We use a pod structure, where in each pod, we have four people: a manager, a senior and two trainees. One pod can take care of 100 clients. For our clients, we’ve really been surprised about the positivity. We’ve had a couple of questions like ‘What does it really mean for me in reality?’ In these cases, you may need to offer reassurance, revisit your processes and assure your client that they will receive the support they need, when they need it. This is also a case of knowing what we want to do. It’s the way we live as a business. When we moved all our clients to the cloud ten years ago, no-one else had done that before. Our clients are great because they’re happy to be on this journey with us, while we break boundaries and reimagine the accounting firm of the future. For our team, this sense of innovation and continuous improvement is fostered naturally. After all, they are the ones who take ideas and make them happen. It makes sense to give something back. Will Farnell is founder of Farnell Clarke, a forward-thinking accounting firm based in Norwich and London. As one of the first 100% cloud practices in the UK, Will offers mentoring services, strategic support and deep-dive workshops to help you in your journey to digital transformation. Find out more here.